Room darkening pleated shades with an added "no holes privacy" upgrade designed to block more light and provide more privacy that standard pleated shades. Typical pleated window shades have holes through the center of each pleat to allow the lift cords to run through the shades. With our unique room darkening pleated shades design, the no holes privacy has a tab on the back of each pleat through which the lift cords are threaded. This design eliminates the visible holes in the shades. 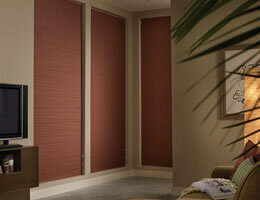 Note: Because of the nature of pleated shades, the front of the blinds are thicker than the back when compressed. This may cause a slight tilt to the bottom rail when the shades are lifted. Are these pleated shades washable? The Room Darkening Pleated Shades with no holes privacy are anti-static and repel dust, but occasional cleaning may be necessary to keep the fabric clean and bright. The fabric can be dusted with a soft, clean cloth, feather duster or lightly vacuumed with a soft brush attachment. To spot clean, use a cloth dipped in a light solution of lukewarm water and clear mild dish detergent and lightly dab. Do not scrub the surface, and rinse thoroughly. When we moved into a rental property and had to outfit it with window coverings, I hadn't purchased blinds for several years but took a chance on Blinds Chalet when I found it online. When we moved into a rental property and had to outfit it with window coverings, I hadn't purchased blinds for several years but took a chance on Blinds Chalet when I found it online. The website was impressive and made me think they knew what they were doing and we were not disappointed. The only things we should have done differently was (a) one window is narrower at the bottom and we didn't pick up on that until after installation when we found it difficult to lower all the way to the bottom sash without pulling it out, away from the window, and (b) one of the windows is quite wide so the shade is fairly heavy. Next time I might consider getting two shades that meet in the middle instead as the pull cords want to break if we don't take extra care. I offer these things as a potential help to others who deal with the same thing. We have found the quality to be exceptional and price reasonable with quick service. We were so impressed that when we decided to cover our kitchen window as well, we didn't consider going anywhere other than Blinds Chalet and again we were not disappointed. Thank you for a great product at a reasonable price! I have referred you to our daughters for when they need blinds for their homes. My purchase was to be a replacement shade for an R/V and it was exactly what I needed. My purchase was to be a replacement shade for an R/V and it was exactly what I needed. Made perfectly to order, it fit just like the original. Very happy with the purchase, we will be ordering additional blinds for other windows in our home. The shade was perfect for our Master bedroom window which faces south. The shade was perfect for our Master bedroom window which faces south. It fit just as it should. With the use of a clutch system and continuous pull, larger blinds are easier to lift.